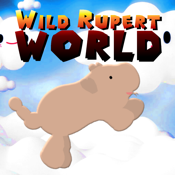 Wild Rupert World - An Amazing Adventure! Rupert is back with another adventure in a fun and addictive game that brings the gaming experience of retro consoles right to your finger tips! Help Rupert the Pig collect as many coins as he can so that you can unlock new characters and new worlds. The better you get, the more game play you'll be able to use! Oh, and did we say that pigs can fly? Yes, that's right! Unlock Angelic Rupert and soar through levels like an eagle!